You picked a bad time to be a vegetarian. Attack of the Killer Tomatoes was a low-budget film co-written, produced, directed, edited and scored by John De Bello that served as a spoof of B-movies. The film dealt with tomatoes suddenly gaining sentience and revolting against humankind. It was only by luring the tomatoes to a stadium and playing the new hit song, “Puberty Love”, that the townspeople could trample and defeat the red menace. The $100,000 film was released by Four Square Productions on October 20, 1978 and pulled in a box office of $567,000. Although it wasn’t a critical success, it has since become a cult classic over the years. Fozzie saves the world from tomatoes. The Tomatoes story could have ended there, if not for another spoof from an unlikely source. 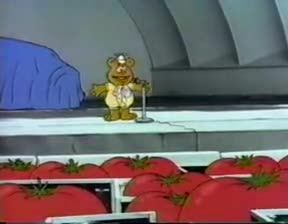 During the 1986 Muppet Babies episode “The Weirdo Zone”, Baby Fozzie (Greg Berg) related a story about how he dealt with an “Attack of the Silly Tomatoes.” The segment featured clips from the movie and generated some of the highest ratings of the season. Inspired, New World Pictures, owner of producer Marvel Productions, approached Four Square about making a sequel with a proposed budget of $2 million. De Bello, along with co-writers and producers Costa Dillon and J. Stephen Peace, accepted the offer and went to work on a script. Return of the Killer Tomatoes was released on April 22, 1988 by New World. The film was set ten years after the “Great Tomato War” in a world where tomatoes were now outlawed. One of the first film’s main characters, Wilbur Finletter (Peace) opened a tomato-less pizzeria and his nephew, Chad (Anthony Starke), was a delivery boy. The film revealed that the tomato uprising was the cause of mad scientist Professor Mortimer Gangreen (John Astin). Learning from his mistakes, Gangreen used music to create mutated tomatoes that resembled normal humans. Different kinds of music produced different results, such as rock music that created soldiers Gangreen intended to use in his plot to take over the world. Gangreen’s plans went awry when his attractive mutated assistant, Tara Boumdeay (Karen Mistal), grew tired of his mistreatment of the fuzzy failed mutation she dubbed F.T. (for Fuzzy Tomato) and defected to the humans. There, she became involved with Chad and passed F.T. off as an ugly dog. Return was a surprise success, and not only did New World greenlight another sequel, but also sought to attract a younger audience with an animated series produced by Marvel. 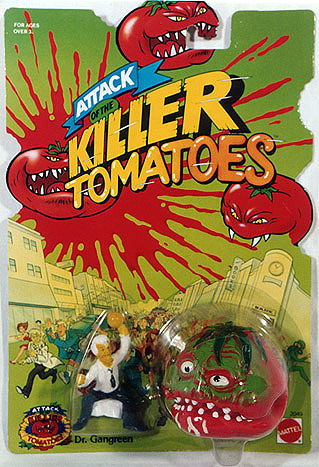 Developed by Richard Mueller, Attack of the Killer Tomatoes essentially combined elements from both movies, but was an expansion of the plot of Return. The series was set five years after The Great Tomato War in the town of San Zucchini. Gangreen was renamed Dr. Putrid T. Gangreen (Astin, reprising his role) to add more of a pun to his name. Tara (Kath Soucie) was given an aversion to condiments as salt would change her from human back into a tomato, while pepper would cause her to sneeze back into her human form. Tara and Chad’s (Christian Guzek) relationship was reduced to their being good friends, although an attraction on Tara’s end was evident. Chad was also slightly younger than his movie counterpart. F.T. (S. Scott Bullock) maintained his secret identity as the world’s ugliest dog, but his ownership kept switching between Tara and Chad in various episodes. Wilbur (Thom Bray) was depicted as slightly delusional from the war and spent most of his time trying out new tomato-less pizza recipes (which often failed), and usually ran around in his flight suit while dragging his deployed parachute behind him. Generally, adults on the show were depicted as dimwitted (with Wilbur being somewhat of an exception), often leaving Chad, Tara and F.T. to foil Gangreen’s plots. 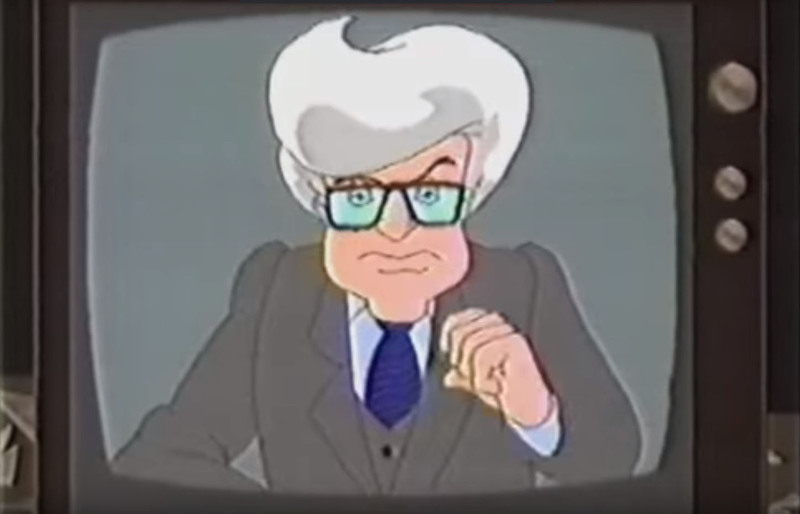 Other characters from the movies included Igor Smith (Cam Clarke), Gangreen’s air-headed assistant who had ambitions of being made a reporter once the tomatoes ruled. 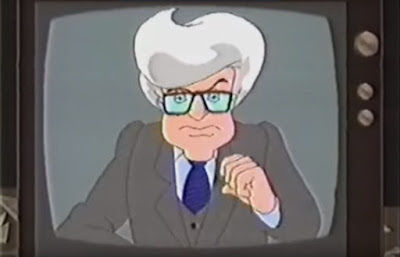 Meanwhile, Whitley White (named Charles in Return, voiced by Neil Ross) was the town’s only reporter who had a habit of appearing during or after the story’s action and simultaneously presenting from the scene and the studio. Five of the six: Zoltan, Mummato, Beefsteak, Ketchuck and Fang. The primary villains of the series were Gangreen’s six tomato soldiers, which Igor accidentally programmed with old movies rather than training videos rendering them lazy and prone to imitating old movie characters. Zoltan (Maurice LaMarche) was the head of this tomato crew, and initially the only tomato who could talk. 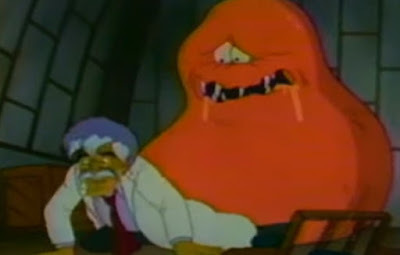 When they were further mutated in the second season, that gang came to include the calm and cowardly Tomacho (Cam Clarke, impersonating John Travolta); short-tempered and bull horned Beefsteak (Chuck McCann); snake-like Fang (Susan Silo), who had fangs filled with venom; the always-hungry and drooling Ketchuck (LaMarche); and Mummato (Rob Paulsen, impersonating Marlon Brando) who was wrapped in bandages like a mummy. Zoltan himself gained an eyepatch and stitching across his face. Gangreen also attempted to fix his mistakes with Tara by creating another minion inspired by his love of rockabilly music, resulting in Johnny Tomato (LaMarche) who resembled a young Elvis Presley. However, he developed feelings for Tara that once again foiled Gangreen’s plans. The KTTF: Mary Jo, Wilbur, Sam and Floyd. 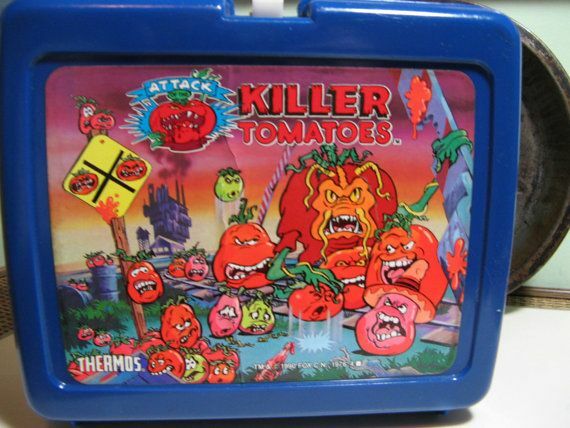 On the human side was the Killer Tomato Task Force (KTTF): the specialized unit formed with the sole intent of keeping tomato attacks at bay and destroying them. While Wilbur, Chad and Tara were often affiliated with the KTTF, their primary members were Sam Smith (Bullock), a master of disguise whose most recognizable outfit was that of the Lone Ranger; Floyd Bridgework (Bray), based on the film character Greg Colburn (Steve Cates in Attack, Ian Hutton in Return), an underwater expert who always wore his scuba gear no matter where he was or what kind of disguise he was wearing; and Mary Jo Nagamininashy (Soucie), based on the character Gretta Attenbaum (Benita Barton), a German athlete who was so into exercise that she did so while battling tomatoes. Mayor Leonard Earwax (Clarke) was the ineptest human character of all, somehow lucking into the job but was in no way an effective leader as he could sleep through his town being conquered by tomatoes. The Censor Lady (Bullock) was the show’s dig at standards and practices as she would pop up at random times to stop characters from doing any kind of imitable behavior (behavior networks felt a child could potentially copy and hurt themselves doing). It was revealed in the episode “Streets of Ketchup” that there may be more to The Censor Lady than appeared, as salt water turned her into a prune much like Tara’s transformations. 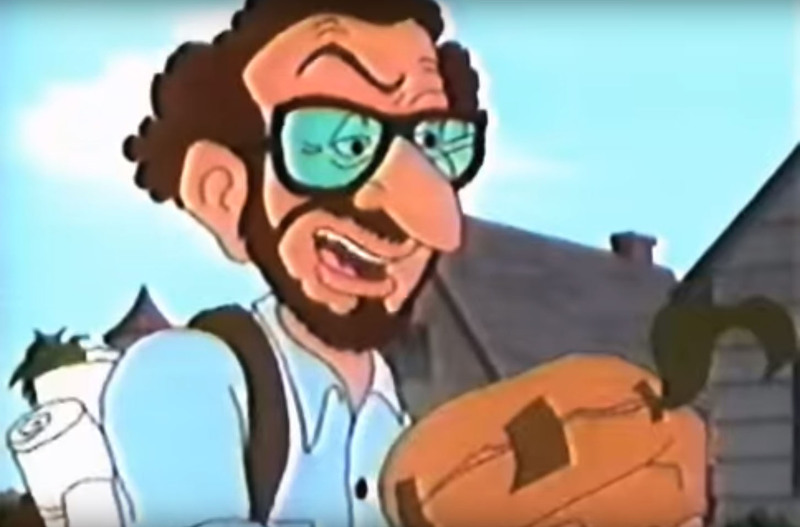 One character who was in every episode was the Tomato Guy (LaMarche, impersonating Woody Allen), who would shout “Tomato!” and send everyone into a panic; in part due to a traumatic childhood incident involving tomato soup. When he wasn’t, he would serve as a speaking extra. Tomato Guy was likely inspired by Dillon’s roles in the films, as he started a panicked stampede by shouting “Tomato!” in the first and filled numerous roles in the second. Attack of the Killer Tomatoes debuted on September 8, 1990, becoming one of the first programs to be aired on the fledgling FOX network’s Fox Kids programming block. De Bello and Peace served as producers, along with Boyd Kirkland. The show attempted to maintain the comedic nature of the films by spoofing other movies and pop culture in every episode, right down to the episode titles. The series’ theme was based on the one from the movie by Dillon, De Bello, Peace, Paul Sundfor and Gordon Goodwin, with Haim Saban and Shuki Levy supplying the rest of the series’ music. Mueller served as the story editor and one of the series’ writers, alongside Flint Dille, Jack Enyart, Gordon Kent and Ted Pedersen. The Tomato Guy in a supporting role as a mailman. The series was a hit for FOX and was quickly renewed for a second season. However, some changes occurred both on screen and behind the camera. Mueller was replaced by Dille, although he still supplied scripts, and Kirkland was replaced by Richard Trueblood. Levy was also the sole composer for the season. Under Dille, the episodic format was jettisoned in favor of an ongoing storyline that saw Gangreen further mutate his six tomato soldiers into giants and use them to conquer the world. However, feeling Gangreen was no longer necessary, Zoltan led a revolt against him and each of the tomatoes took over one of the continents for themselves. Gangreen was forced to work with the KTTF to take the world back (and then promptly betray them). Changes were made to the story and characters that directly contradicted the first season, such as Tara’s being a tomato a publicly known fact, her being able to turn into a tomato at will, and her now having mobility and speech in that form. The further mutation of Zoltan and his crew was done to remove their comedic elements to make them more serious threats. 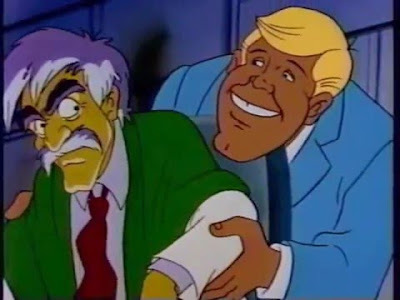 Wilbur was elevated to rebel leader status in the wake of the world’s conquering, which fit the character as he was the more competent adult on the show (which isn’t saying much). The second season intro was also altered to have shots of various kids singing the theme amongst clips of the show, while a colorful tomato bounced on the words on the bottom of the screen. Allusions to the show’s cinematic origins were also made, as parts of the intro took place inside a theater. Gangreen regurgitated by a mutant kumquat. The biggest change was also the most expensive. It was decided to move animation duties from AKOM Productions over to American Film Technologies; a San Diego firm that specialized in the colorization of black and white films. AFT used computers to animate the second season, making it the first fully computer-generated cartoon show. As a result, the backgrounds, animation and character designs had subtle, but noticeable, differences between seasons; particularly in the character movements which were comparable to an early animated PC game. FOX Kids head Margaret Loesch touted the move as a way to keep animation jobs with domestic artists and away from foreign companies. Unfortunately, these changes proved unpopular with the viewing audience. Coupled with the fact that the episodes were initially aired out of order and missed several weeks, the series was quickly cancelled at the end of the eight-episode season. The show did remain on the network well into 1992, and returned in reruns for part of 1996 before moving over to the defunct FOX Family Channel in 1998. 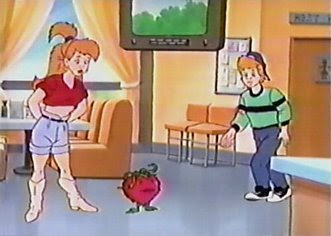 During the second season, Mattel produced a line of two-pack action figures that featured one of the human characters facing off against a giant tomato. The pairings included Wilbur vs. Beefsteak, Gangreen vs. Ketchuck, Igor vs. Fang (named Fangmato), Chad vs. Tomacho, Ranger Woody vs. Zoltan, Fireman Hoser vs. Mummato, and Ultimato (a super tomato Gangreen created to aid the KTTF when he was allied with them) vs. Officer Bookum. To round out the set, Tara and Whitley were paired with two tomatoes that were actually good: Missing Link Tomato and Phantomato. Link (LaMarche) was believed to be the missing link between normal tomatoes and the killer variety and lived in a lavishly furnished lair. Phantomato (also LaMarche), a parody of The Phantom of the Opera, was a deformed tomato in a mask took to the sewers after the tomatoes conquered Earth and aided Tara—once he finished playing his organ, that is. That same year, Imagineering released Attack of the Killer Tomatoes through THQ for the Nintendo Entertainment System. The game was a platformer which had Chad facing off alone against the legions of mutated tomatoes as the rest of the citizenry was too afraid to help. The six main tomatoes were all bosses in the game, as was Phantomato who was once again depicted as a villain. A similar game featuring Wilbur was released on Game Boy in 1992 in North America and the following year in Japan as Killer Tomato by Altron. Simplicity produced a costume pattern for adults and kids, and Thermos released a lunch box. Although the show was never allowed a true conclusion, the machinations of Gangreen and Igor (Steve Lundquist) continued in film as Return’s success spawned two direct-to-video sequels. 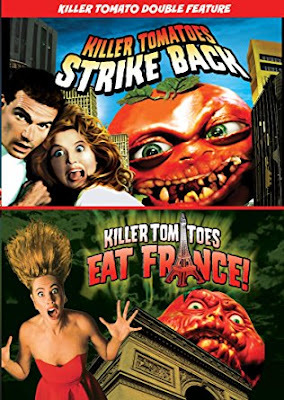 1990’s Killer Tomatoes Strike Back was the first time the tomatoes were featured with faces on-screen, despite having them in all the promotional materials for the other movies and in the cartoon. It was the last movie to feature Wilbur. The final film, 1991’s Killer Tomatoes Eat France!, featured Gangreen attempting to use an old prophecy to his advantage with the help of Igor. France! was the first film to feature the tomatoes speaking fluent English rather than their own language, and other fruits and vegetables gained sentience outside of Gangreen’s experimentation. Gangreen’s tomato minions from the cartoon also appeared. In 2008, a remake of the film was announced but has yet to make any progress or see fruition, which means that the tomato threat is finally over. For now. Say, how’s that salad of yours there? “Give a Little Whistle” (9/8/90) – Gangreen invents a whistle that causes tomatoes to attack, while Igor and Zoltan kidnap Whitley so that Igor can fill in for him. “Attack of the Killer…Pimentoes?” (9/15/90) – Gangreen’s new tiny cherry tomato grows bigger the more it eats, and soon giant tomatoes invade San Zucchini. “Tomato from the Black Lagoon” (9/22/90) – Gangreen and Igor set out to capture and examine the Tomato Link, who has already captured Tara. “Streets of Ketchup” (9/29/90) – Gangreen creates Johnny Tomato for his latest schemes, but those get derailed when he meets Tara. “Tomato Invasion from Mars” (10/13/90) – Aliens come to Earth seeking mutated seeds from Gangreen. “War of the Weirds” (10/20/90) – When Igor is bullied it reminds Gangreen of his own rival, starting a war between his tomatoes and his rival’s kumquats. “Invasion of the Tomato Snatchers” (10/27/90) – Gangreen plots to replace the citizens of San Zucchini with versions that he grows and can control. “Terminator Tomato from Tomorrow” (11/10/90) – An android tomato from the future comes back in time and helps Gangreen remove the entire Tomato Task Force. “Camp Casserole: So Vine” (11/17/90) – While Chad, Tara and FT head to camp, Gangreen creates a giant tomato that accidentally awakens early. “Spatula, Prnze of Dorkness” (11/24/90) – Zoltan is transformed into a vampire and proceeded to kiss humans and vampires to change them as well. “Frankenstem Tomato” (12/1/90) – Wilbur, Chad, Tara and FT take shelter in the Frankenstem Castle where Gangreen seeks to capture Tara and put her brain in the Frankenstem monster. “The Gang That Couldn’t Squirt Straight” (12/15/90) – Wilbur, Chad and Tara investigate a group of tomato gangsters attacking and destroying various businesses. “Beach Blanket Tomato” (12/29/90) – Gangreen unleashes a group of tomato sharks on San Zucchini’s harbor. “The Ripening Disaster” (9/7/91) – Gangreen decides to turn his tomato minions into giants, which allows him to finally conquer the world. “A Rotten Reversal” (9/14/91) – No longer needing Gangreen, his minions betray him and assert their dominance over the continents for themselves. “Phantomato of the Opera” (9/21/91) – Wilbur, Chad, Tara and Igor go searching for Gangreen when he leaves a message that he’s heading to the opera. 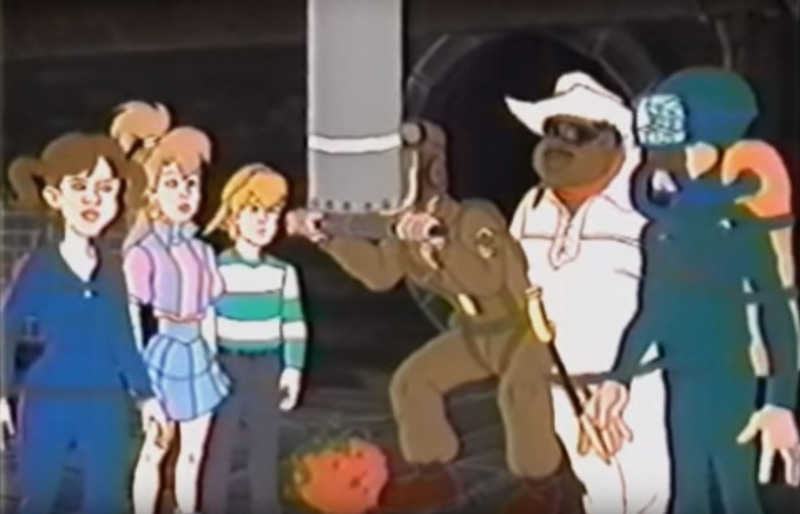 “Stemming the Tide” (10/5/91) – The KTTF sets out to rescue Gangreen and Igor from Gangreen’s lab while the tomatoes set out to conquer the Heart of Africa. “The Tomato Worms Turn” (10/19/91) – Gangreen, Igor, Chad, Tara and FT head to the Bleching Congo to retrieve tomato worms. “Ultra-Tomato III” (11/2/91) – NO SYNOPSIS AVAILABLE. “Tomatotransformation” (11/9/91) – NO SYNOPSIS AVAILABLE. 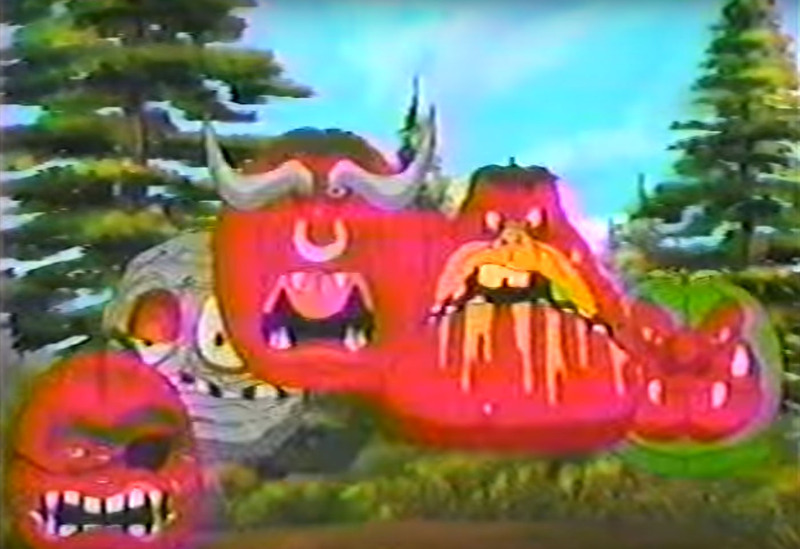 “The Great Tomato Wars” (11/23/91) – When Zoltan is kicked out of the group, he goes back to Gangreen for a new army of tomatoes made from moon dust. Originally posted in 2017. Updated in 2018.